What runners wear on their feet has become a multi-million pound/dollar/euro industry. The big players – Nike, Adidas, Asics and the rest – are also major earners in the general leisure wear market which covers wee boys in a scheme as well as ‘personalities’ on their yachts and the top athletes, whatever their discipline, are courted assiduously by the clothing companies. I was asked at one time if one of my athletes would switch from his then sponsor to a new company so I put it to the runner. His conditions included ‘unlimited kit’ every year: he was at that time on £1000 of kit that year. The top guys get their money for just about anything done in their kit including race bonuses, the wearing of their kit, having the logo stitched on the T shirt that they happen to be wearing, etc. In 1969, the year before the 1970 Commonwealth Games, the IAAF said that from the end of the year, no athlete would wear shoes with the name or logo of the manufacturer on them – they were to wear plain white shoes. Well, we’ve all seen the pictures of the athletes in 1970 with shoes that were not plain white! The picture above was sent to me by Hugh Barrow of Victoria Park AAC. Bob Izzatt, an old team mate of his at Scotstoun, had been clearing out his garage recently and had found two pairs of these shoes. They had been hand made by a cobbler who used to go to Scotstoun every week and made shoes for the athletes. He would measure the athlete’s feet, go away and return a week or two later with the finished items. Bob did well to keep them and they should probably be on display somewhere by now. We know that Roger Federer has his gold shoes made specially and the best in every sport have special footwear designed for them to give them maximum performance – and the manufacturer maximum publicity. It is doubtful whether they received the attention that Jock gave to Bob’s shoes! Have a read at that and see if we are better off in the twenty first century. While spikes made a big difference to track and cross-country runners, an arguably bigger step forward for sprinting was made when starting blocks were invented. The photograph above is of the man who is generally given the credit for the invention – Harry Rottenburg. Rottenburgh was an international rugby player who came from Glasgow and was educated at Kelvinside Academy, Loretto and Cambridge. A top flight rugby man, he gained his blue at Cambridge and also played for Lndon Scottish after graduating in 1899. He also played for the Barbarians in their first match against foreign opponents (Stade Francais) before getting his Scotland cap at full back later in 1899. also celebrated as an outstanding engineer, he specialised in devising sporting equipment. The starting blocks were the best example of this talent. 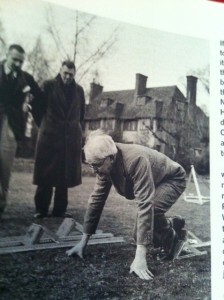 He invented the prototype of the modern starting blocks which were first used in the London Olympics in 1948. He is seen above trying them out! He lived in Cambridge until he died in 1955.